It's economical, ecological, and environmentally-friendly. In many cases, it's downright delicious. And there is a chance that you could die. This seems to be the main thesis of the new "field-to-kitchen guide," Edible Wild Mushrooms of Illinois and Surrounding States, by Joe McFarland and Gregory M. Mueller. In describing this book's place on my summer reading list, I've met it with laughter, incredulity, and one very frank text message: "Oh Jesus, when you put it in writing, a book about mushrooms sounds like one of the most boring things ever." I can gladly report that this has not in fact been my experience with Edible Mushrooms (the book, not the act itself. Yet). This has been helped in small part by pages upon pages of glossy mushroom photos and an entire chapter of recipes -- the carrot at the end of the mushroom stick. But the writing itself is the real key. A far cry from the guidebooks of my childhood, which were passed around reverently from the outdoors of Indiana to northern Wisconsin and Michigan's Upper Peninsula to identify birds, bugs and trees (we were a nature-friendly family), this particular guide seems to have been written with the express intention of being actually read. Field guides often seem more like the lifeworks of graduation biology students with telephoto lenses and no ability to make small talk. McFarland and Mueller, happily, seem like they might be fun at a party. Not a bad claim for mycologists. Rife with earnest yet sweetly sarcastic commentary, the book addresses common mushroom beauty queens like morels and chanterelles with slightly irreverent, if knowing tips. The "Big Questions" of morel hunting are gently mocked, and then fully answered: where to find them, when they'll appear, how to console oneself when returning from the forest empty-handed. Chanterelles' desirability is questioned, but the multitudinous varieties are still generously described and pictured, including less-common Red Chanterelles, a "colorful escape from salad boredom." Far from taking a militant position on the enjoyment of wild mushrooms, the authors indeed seem to shed perhaps a bit more light on why so many folks just don't dig the fungi. Mushrooms, it seems, affect different people in different ways -- while some gourmands may not experience any reaction beyond an errant yummy noise, others may end up a bit nauseous from their mushroom meal, even when eating the exact same specimens. Less consciously perhaps, their detailed description of what exactly mushrooms are and do in the greater ecology of our yards and forests also veers into the off-putting. Mycelium, spores, fungal threads that can extend invisibly for miles...shudder. As so often happens with a microscopic inspection of what we eat, it all gets just a little gross. Perhaps in response to this squeamishness, McFarland and Mueller seem to encourage experimentation before you rule out foraging for fungi altogether. As they put it, "People should try a few different species of mushrooms in their life before deciding they don't like mushrooms. It's like being opposed to music based on a specific hatred of the zither." However, given their colorful descriptions of the various forms of gastrointestinal distress caused by eating a misidentified mushroom (referring to the Green-Spored Lepiota as a "stomach-wrenching terror found on front lawns everywhere"), it's made perfectly clear that short of death, careless mushroom-hunting can still get ugly -- and that our guides may have thrown themselves onto the front lines in service of this discovery. Not including the highly concerned Preface and page entitled "Do Not Ignore This Warning," followed by a skull and crossbones image, the first 31 pages of the book are a treatise on your possible mushroom-related death. Blessedly, things lighten up from there as imaginative descriptions, basic facts and photo after photo of mushrooms spill out from the book. The range of mushroom names alone conjures up a lively menagerie of creatures and colors. Some names belie their edibility, like Oyster, Hen-of-the-Woods, Cauliflower, Honey mushrooms. Even the Wood Ear and Boar's Head sound vaguely edible. Many names mask surprising flavors, such as the Lion's Mane mushroom, which boasts a supposedly sweet, crab or lobster-like flavor. Or Pheasant's Back, whose speckled appearance recalls the plumage of an Asian pheasant, but whose aroma is more reminiscent of watermelon rind. Or the Lobster Mushroom, which isn't a mushroom at all but rather an evidently tasty colonizing "parasitic infection" (gah) that simply transforms a plainer host. What a fascinating world to have uncovered right here in our collective backyard. McFarland and Mueller also provide guidance on where to find your own shrooms. Not surprisingly, your back yard is fair game. If you're like me and your "back yard" is the tar-sealed roof of your landlord's garage, this may be a more challenging undertaking. Don't assume that the neighborhood park is the next viable option--or even the Cook County Forest Preserve. 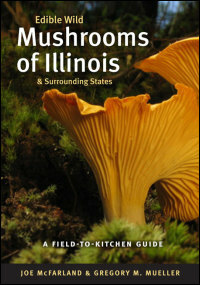 While the book includes an entire chapter entitled "Let's Eat," and populated with both mushroom preservation details as well as recipes from a broad variety of Illinois restaurants, I wish that the mushrooms' descriptions had included as much information about each specimen's taste, texture and cooking options as they offer on habitat, stem appearance and spore color. Though the section on creating crucially important spore prints did seem like an interesting arts and crafts project (which could also keep you from dying! ), it seems like an edible mushroom guide could have at least as much time on mushroom stamps as on what exactly makes these fungi worth eating. I saw Beth Botts mention this book on her blog and it piqued my curiosity and your post solidified my interesting in getting my hands on a copy of this book. My grandfather just sent me a decades old guide to North American mushrooms. The first 25 pages are also all about how mushrooms can kill you or at least permanently damage your liver. It must be a rule with mushroom guides. Only the [fool]hardy will continue!